In a damaged cell HSP70 maintains protein homeostasis. To achieve this, HSP70, together with co-chaperones, prevents protein aggregation, aids in the dissociation of formed protein aggregates, and targets particular “irreparable” proteins for degradation. In addition, because of HIF-1 activation, the restoration of protein homeostasis forms a specific cell defense against hypoxic injury, against free-radical injury owing to an increase in antioxidant activity, and against calcium injury owing to a reduction in the calcium level in the cell. HSP70 can deposit mutant proteins. However, such mutant proteins can be released when denatured proteins appear in the cell. 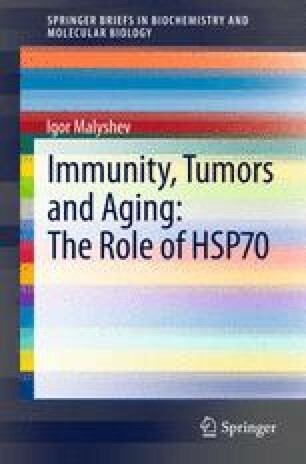 HSP70 blocks apoptosis by inhibiting the release of proapoptotic factors from mitochondria, inhibiting AIF, caspase-9 and JNK activities, as well as by increasing the Bcl-2 level and decreasing the Bax level. HSP70 protects cells from the accidental triggering of apoptosis by restricting DNA-ase folding until the inhibitor binds to this proapoptotic protein. All of the above processes lead to the general conclusion: HSP70 is a component of an intracellular system aimed at maintaining protein homeostasis and protecting damaged cells.